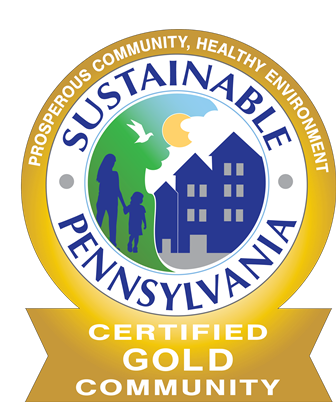 East Goshen Township (EGT) is proud to be recognized at the Gold level in the Sustainable Pennsylvania Community Certification program. EGT is the first municipality to achieve a Gold level of certification in Chester County, and one of only thirty-nine across the Commonwealth of Pennsylvania! In earning the Gold certification, EGT is acknowledged for its progress in such areas as community design and land use, energy efficiency, health and wellness, intergovernmental cooperation, recycling and waste reduction, fiscal controls, and internal management and operations. Details about EGT’s certification performance within these topics can be found on the certification program’s website. It will provide Township officials knowledge of current successes and areas of opportunities with regards to sustainability initiatives. It can become a planning document to help identify and prioritize future sustainability initiatives. Certification is point-based, and range from Platinum to Associate levels. We look forward to submitting our application this summer and sharing the results with the public shortly thereafter.